A coat of arms, more properly called an armorial achievement, armorial bearings, or often just arms for short, in European tradition, is a design belonging to a particular person (or group of people) and used by them in a wide variety of ways. Historically, they were used by knights to identify them apart from enemy soldiers. In Continental Europe, commoners were able to adopt burgher arms. Unlike seals and emblems, coats of arms have a formal description that is expressed as a blazon.In the 21st century, coats of arms are still in use by a variety of institutions and individuals (for example several universities have guidelines on how their coats of arms may be used and protect their use). The art of designing, displaying, describing and recording arms is called heraldry. The use of coats of arms by countries, states, provinces, towns and villages is called civic heraldry. In the heraldic traditions of England and Scotland an individual, rather than a family, had a coat of arms. In those traditions coats of arms are legal property transmitted from father to son; wives and daughters could also bear arms modified to indicate their relation to the current holder of the arms. Undifferenced arms are used only by one person at any given time. Other descendants of the original bearer could bear the ancestral arms only with some difference: usually a color change or the addition of a distinguishing charge. One such charge is the label, which in British usage (outside the Royal Family) is now always the mark of an heir apparent. In time, the use of arms spread from military entities to educational institutes, and other establishments. According to a design institute article, "The modern logo and corporate livery have evolved from the battle standard and military uniform of medieval times". 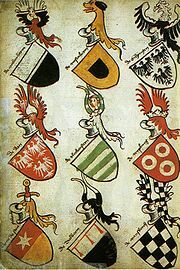 In his book, The Visual Culture of Violence in the Late Middle Ages, Valentin Groebner argues that the images composed on coats of arms are in many cases designed to convey a feeling of power and strength, often in military terms. The author Helen Stuart argues that some coats of arms were a form of corporate logo. Museums on medieval armory also point out that as emblems they may be viewed as precursors to the corporate logos of modern society, used for group identity formation. The Queen of Canada has delegated her prerogative to grant armorial bearings to the Governor General of Canada. Canada has its own Chief Herald and Herald Chancellor. The Canadian Heraldic Authority is situated at Rideau Hall . In Scotland, the Lord Lyon King of Arms has criminal jurisdiction to enforce the laws of arms. In England, Northern Ireland and Wales the use of arms is a matter of civil law and regulated from the College of Arms . In reference to a dispute over the exercise of authority over the Officers of Arms, Arthur Annesley, 1st Earl of Anglesey, Lord Privy Seal, declared on 16 June 1673 that the powers of the Earl Marshal were "to order, judge, and determine all matters touching arms, ensigns of nobility, honour, and chivalry; to make laws, ordinances, and statutes for the good government of the Officers of Arms; to nominate Officers to fill vacancies in the College of Arms; to punish and correct Officers of Arms for misbehaviour in the execution of their places". It was further declared that no patents of arms or any ensigns of nobility should be granted and no augmentation, alteration, or addition should be made to arms without the consent of the Earl Marshal. Today, the term "coat of arms" is frequently applied in two different ways. In some uses, it may indicate a full achievement of arms or heraldic achievement, which includes a variety of elements — usually a crest sitting atop a helmet, itself sitting on a shield; other common elements include supporters holding up the shield and a motto (beneath in England, above in Scotland). Some people wrongly use "coat of arms" or "arms" to refer to the escutcheon (i.e., the shield itself), or to one of several designs that may be combined in one shield. (Note that the crest is one specific part of a heraldic achievement and that "crest of arms" is a misnomer.) The "coat of arms" frequently are adorned with a device - a motto, emblem, or other mark used to distinguish the bearer from others. If a motto is a part of the achievement, it sometimes has some punning allusion to the owner's name. A device differs from a badge or cognizance primarily because it is a personal distinction, and not a badge borne by members of the same house successively. The Vatican has its own coat of arms. As the Papacy is not hereditary, its occupants display their personal arms combined with those of their office. Some Popes came from armigerous (noble) families; others adopted coats of arms during their career in the church. The latter typically allude to their ideal of life, or to specific Pontifical programmes. A well known and widely displayed example in recent times was Pope John Paul II's coat of arms. His selection of a large letter M (for Mary) on his coat of arms was intended to express the message of his strong Marian devotion. Roman Catholic Dioceses also are assigned a coat of arms. A Basilica, or papal church also gets a coat of arms, which is usually displayed on the building. These may be used in countries which otherwise do not use heraldic devices. The Japanese equivalents, called kamon (often abbreviated "mon"), are family badges which often date back to the seventh century, and are still actively used in Japan today. The Japanese designs are distinctly different from European formats and often use floral and abstract patterns. For instance, the mon of the powerful Tokugawa Ieyasu simply consisted of three leaves. Yet, even these simple designs often express an origin. An example in recent use is the logo of Mitsubishi corporation which started as a shipping and maritime enterprise and whose emblem is based on a water chestnut derived from its maritime history with a military naval influence. The word mitsu means the number 3 and the word hishi meaning "water chestnut" (pronounced bishi in some combinations; see rendaku) originated from the emblem of the warrior Tosa Clan. The battleships of the Tosa Clan had been used in the late 19th century in the First Sino-Japanese War to reach Korea and their name gave rise to the term Tosa class battleship. The Tosa water chestnut leaf mon was then drawn as a rhombus or diamond shape in the Mitsubishi logo. In the Nordic countries, provinces, regions, cities and municipalities have a coat of arms. These are posted to the borders and shown in official documents advertising the area. At a national level, "coats of arms" were generally retained by European states with constitutional continuity of more than a few centuries, including constitutional monarchies like Denmark as well as old republics like San Marino and Switzerland. Since 1989, some of the ex-Communist states, such as Romania, have resumed their former arms, often with only the symbols of monarchy removed. The Great Seal of the United States is often said to be the coat of arms of the United States . The blazon ("Paleways of 13 pieces, argent and gules; a chief, azure") is intentionally improper to preserve the symbolic number 13. Most American states generally have seals, which fill the role of a coat of arms. However, the state of Vermont (founded as the independent Vermont Republic) follows the American convention of assigning use of a seal for authenticating official state documents and also has its own separate coat of arms. Many American social fraternities and sororities, especially college organizations, use coats of arms in their symbolism. These arms vary widely in their level of adherence to European heraldic tradition. Organizations formed outside the United States with U.S. membership also may have a coat of arms. Roman Catholic dioceses and cathedrals have a coat of arms. However, today, nearly every nation in every part of the world has its own coat of arms, in many cases emblems that do not fully conform with European heraldric traditions. Such coats of arms often combine a European form with indigenous emblems. For example the coat of arms of Kenya features a shield in the shape of shields traditionally used by the Maasai, and a motto in Swahili. Note that not all personal or corporate insignia are heraldic, though they may share many features. For example, flags are used to identify ships (where they are called ensigns), embassies and such, and they use the same colors and designs found in heraldry, but they are not usually considered to be heraldic. A country may have both a national flag and a national coat of arms, and the two may not look alike at all. For example, the flag of Scotland (St Andrew's Cross) has a white saltire on a blue field, but the royal arms of Scotland has a red lion within a double tressure on a gold field. College of Arms Repository of the coats of arms and pedigrees of English, Welsh, Northern Irish and Commonwealth families and their descendants.